The use of technology has been discussed in many sessions in AORTIC. Internet access is not comprehensive but the majority of people in Africa have a cell phone. The problem with cell phone communication is that it is expensive. How can cell phones (smart or otherwise) be used to improve patient care in a low income setting? 1. Many patients get lost to follow up. The reasons are multifactorial. If a clinic has a contact number for a patient, they can be kept in the system. There are several projects that have shown the successful use of cell phone communication with patients. In Tanzania, mobile technology has been used to tell women where to go to get health care. (Vodacom also sponsored the transport for women to get to the appropriate clinic). 3. In the radiotherapy session, a whole presentation was devoted to the use of smart phones in radiotherapy. 5 billion people do not have access to safe surgery. 143m more surgical procedures need to be performed in LMIC annually if health standards are to be optimized. Less 5% of all cancer research is about surgical management. There is a paucity of specialists in Africa for example, there is 1 urologist in Nigeria per 3 m people. What can be done? What is being done? There was a general consensus that there is a need for appropriate training to be done in centres of excellence in Africa. It is not ideal for surgeon to have to go out of the continent for training. Prof Gueye from Senegal discussed the plan for training centres in West Africa and gave examples of what has been achieved. Technology can be integrated into the process of training. He lamented the brain flight from Africa and said that Senegalese doctors end up working as nurses in Europe. Research from LMIC must be published. There was a general plea for international journals to accept studies from low income countries. 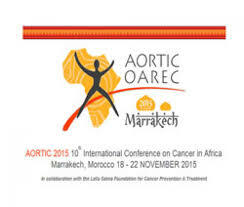 (As an aside, even at AORTIC, which is an African cancer organization, only 36% of the keynote speakers of those in the plenary session were from Africa). The relevant government departments must be lobbied. They must ensure visa requirements are appropriate for trainees. (Travelling with an African passport can be problematic even to neighboring countries.) The DoH has a responsibility to provide the necessary environment for a specialist to be able to practice the skills that have been learnt. A trained surgeon will leave for greener pastures if they have to constantly contend with shortages, poor administration and inadequate basic facilities. (We heard many stories of no electricity, toilets that don’t work, no paper to write notes). Training programmes should be combined with service delivery projects. For example, if a surgeon goes for an out reach programme, the opportunity to train local medical personal must not be missed. Conversely, a training programme should be used to provide a service to the local community. It was a refreshing and important session. Many thanks to the organisers for including it in the programme. Lastly, the Breast Course for Nurses would like to thank Well Woman Diagnostics for sponsoring my travel.